or Rosewater as you Like it for taste, put about 2 Spoon fulls of flower Sweaten to your taste, mix all this together, and then melt half a pound of butter and stirr it in a deep dish & bake it if you turn it out have Little melted butter & sugar & sack for sauce How to make an Orange pudd- Take the Yolks of 12 Eggs and beat them very well then take half a pound of white Sugar finely beaten Stirr it into the eggs then take half a Candid orange and Slice it as thin as you can Stirr it into the eggs with half a pound of frish butter melted, beate all these together, then make a fine Sugar crust or puff past lay it into a dish and pouer your butter in upon the Crust and lay Crust over it & Soe bake it. 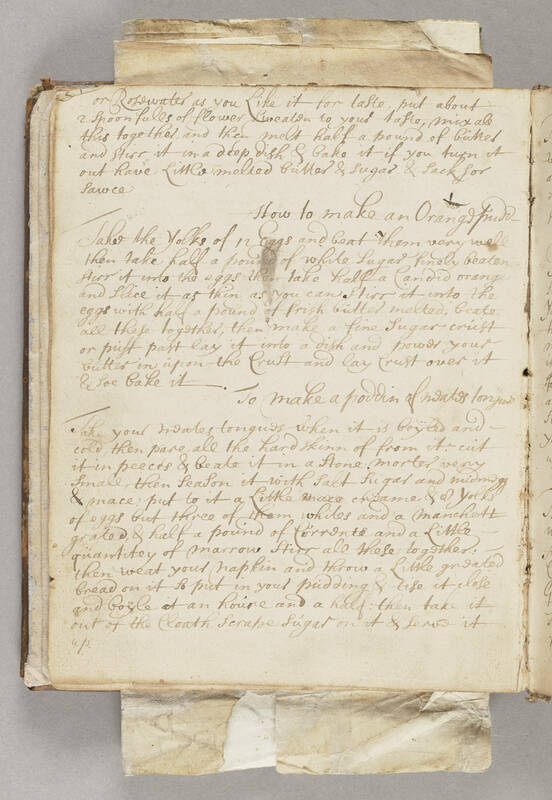 To make a puddin of [meates?] tongues creame & 8 Yolks of eggs but three of them whites and a manchett grated, & half a pound of Currents and a Little quantitey of marrow Stirr all these together. then weat your napkin and throw a Little greated bread on it to put in your pudding & [tie?] it close and boyle it an houre and a half: then take it out of the Cloath Scrape Sugar on it & serve it up.